Recently I was flicking through my blog posts, hoping it would spark some inspiration, when I realised that I hadn't even written a post about a festival that I recently went to! I had such a lovely day and was really impressed by the accessibility there so thought that it wasn't too late to pop up a little post about it! An opportunity came my way that fits in perfectly with this too so I just had to do a write up! So, the Big Weekend! This year Hull, where I live, is the 2017 City of Culture so it made total sense for the BBC Radio 1 free festival to head up north to treat us all to a weekend of good music, good food and good company. Tickets were mainly given to those living in Hull and wow did I pick a good year to move here! Me and my partner managed to snap up tickets for the Sunday, with a line up including Kings of Leon, Bastille and Stormzy. We had absolutely no idea what the accessibility would be like from the start but felt it was an opportunity we couldn't say no to, especially when we were some of the lucky people that managed to get a pair of tickets. Now, I'm a powerchair user but I knew that the festival would be held mainly on grass, which my basic powerchair doesn't handle too well so made the decision from the start to attempt the day on crutches. Ambitious I know. As I said though it's not likely I'll be able to go to another festival in the near future so I was sure it would be worth one intense day of pain and weeks of recovering. We booked our place on the disabled viewing platform's, of which there was one at every single stage and crossed our fingers that everything would be okay! I bought myself a special pair of crutches to get me through the day and then we were off. Just about everyone had to get the shuttle bus to get to the festival, just because of where the venue was and this was the part we were most worried about. I really struggle to stand upright for more than a few minutes so we worried about having to queue, with queues having been hours long the previous day but in the end we managed to skip most of the queues! For disabled guests with a blue badge there was plenty of parking available and this is when having a WAV (wheelchair accessible vehicle) from somewhere like Mobility Nationwide would have come in handy! They've been offering customers a wide range of used wheelchair accessible vehicles since 2004, they make me wish I knew how to drive! Once we got to the venue we headed in through an accessible entrance, meaning we didn't have to stand in the queues and we were able to get our wristbands allowing us entrance to the viewing platforms. At this point we had about half an hour until the first act we wanted to see were on so we headed to the platform and got comfy. This was at the second stage, there was a wheelchair accessible portaloo outside, a ramp to enter the tented stage and a plenty big enough viewing platform with chairs and spaces for wheelchairs. We picked our seats and were pleasantly surprised by how good our view was! The main stage viewing platform was even more impressive. It had 3 wheelchair accessible portaloos and 2 ramps to access the platform. It was by far the biggest viewing platform I've ever seen! There was a signer at one end, keeping up with all the songs and having a ball themselves, this was really lovely to see and I think other festivals should be doing the same. What blew me away the most though was the waiter service! Yes, you heard me right! We were able to order our drinks and have them brought to us, instead of having to trek over to the bar's to tackle to the crowds. What a brilliant idea! The only thing about the day that could have been improved was the organisation of the shuttle buses and how disabled people getting them were handled. Staff were more than happy to let us skip the queues but it would have been must easier if there was more advice about this from the start, I think they assumed that most disabled people would be driving and using the blue badge spaces. Honestly though in terms of accessibility it was one of the easiest days! I've had more trouble going into town to do some shopping. Of course, not all days out are quite as easy as this one though and I do wonder how it would have differed if I had a powerchair capable of tackling grass. It took a lot of planning in advance, a lot of resting in the days before and I even had to buy a new pair of crutches capable of getting me through the day but I'm definitely used to the increased planning that it takes to leave the house by now. 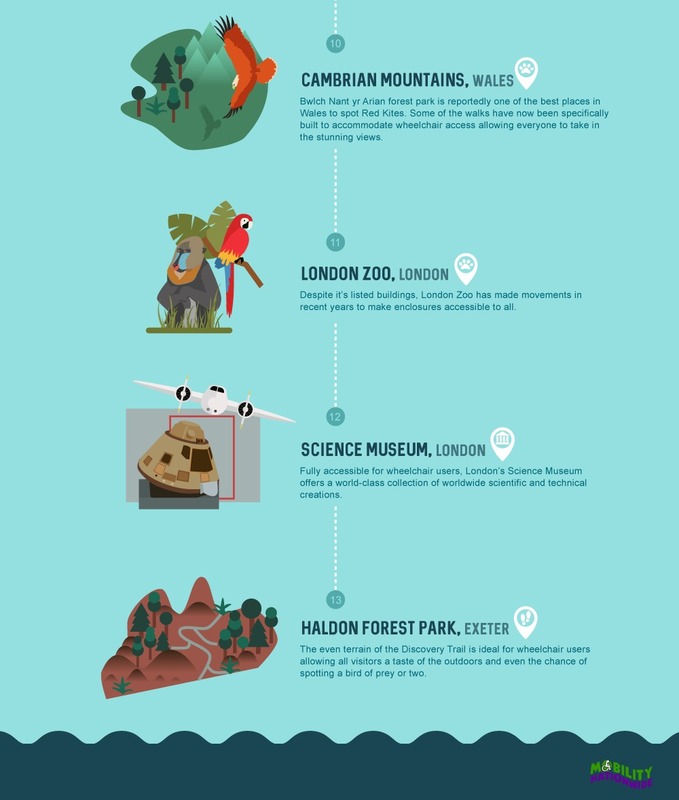 If you're planning a day out this Summer then why not check out some of the places in the infographic above? You might be surprised at how accessible some days out can be, just like I was! If you're worried about the accessibility of somewhere that you are visiting I always recommend contacting the place and asking what they have in place to help you out! They might even have some accessibility information on their website already but it doesn't hurt to ask. If somewhere comes back saying they aren't wheelchair accessible or they don't cater for blind visitors, for example, then you have a great opportunity to recommend changes for them to become more accessible! What's the most accessible day out that you've had? That's really good. I was intrigued to read this as my mum uses a wheelchair too, and I wanted to see what it was like at any festival really for accessibility. I haven't been to that festival before but it sounds really cool and the accessibility sounds like it was a bit easier than I imagined it would be for a festival. It's good you could skip the queues too. Thanks for this post it was very informative.